Cosmetic dentistry: Generally, cosmetic dentistry is any form of dentistry that enhances your smile. In today's world of cosmetics, most people consider that to be bleaching or porcelain veneers. Porcelain veneers are actually pieces of porcelain that are bonded to the front of your teeth. Most require preparation of your teeth, so the procedure is not reversible. Veneers can change the color and shape of your teeth. They have a life expectency of about 10-12 years. They are excellent restorations that can give you the type of smile that you want. White bonding: White bonding is a procedure where a plastic material that matches your tooth is chemically bonded to your tooth. It can be used to cosmetically reshape your teeth. It can be used to fill in gaps or change the shape of teeth. It also could be used to remove or cover certain types of surface stains or defects in the way a tooth formed. Alot of the time bonding can be done with out the need to numb your teeth. It is also quite a bit less expensive than doing porcelain veneers. Also, it can easily be repaired if fractured or displaced. 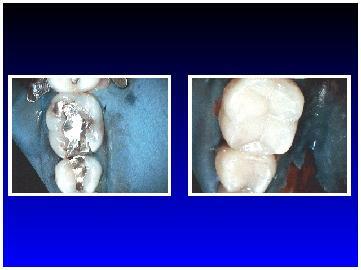 White crowns and fillings: For years fillings and crowns were done with metal or silver amalgam. While we still use these materials in limited situations, most fillings and crowns made today are made of composite or porcelain material. The emphasis is both that it functions or chews well, and looks like your natural tooth. Any metal filling or crown can be changed to a white composite filling or porcelain crown. We now have all ceramic (metal-free) crowns that can be used to replace any missing teeth or crown those that need to be capped (crowned). Bridges: Bridges are a method for replacing missing teeth, without having to have teeth that are removeable. 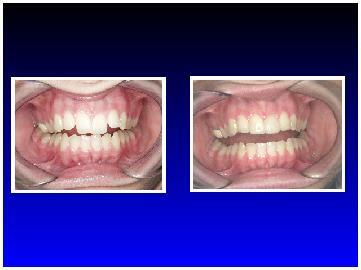 They are permanently cemented to teeth that are adjacent to the teeth that are missing. To do bridges, you have to have teeth with good bone support around the teeth you are trying to replace. The only thing that is different is you have to learn to floss slightly differently underneath your new bridge. Impants: These are replacements for missing teeth that are constructed without involving other teeth. An implant, or titanium post is placed in the jawbone and a single tooth is placed on top of it to replace the missing tooth. 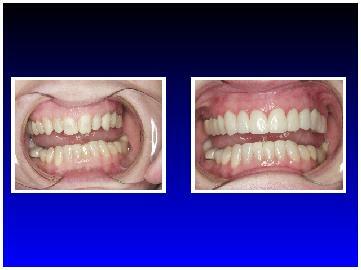 Implants are extremely successful and are an excellent choice to restore missing teeth. An oral surgeon places the implant in the bone and we place the crown that goes on top of it. Teeth Whitening: Teeth whitening is a procedure that can be done many different ways. It should not be done if you have sensitive teeth or front teeth with lots of crowns or fillings, as these materials do not bleach. The first method, you can buy over the counter bleaching systems that will whiten your teeth. They are ususally messy to use and generally do not work that well. The best OTC product seems to be Crest white strips. The bleach is also not as strong due to a poor fit of the different systems. The second method is called tray, or home bleaching. 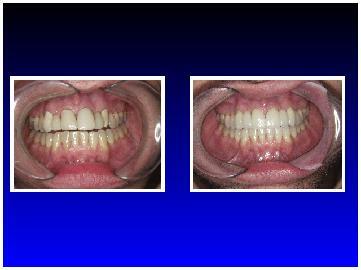 You will have impressions taken on your upper and lower teeth so that custom trays can be made to fit your teeth. You apply the bleach in the trays and wear them for 1-2 hours per day for several weeks. The last method is the most popular and definitely most effective. It is the ZOOM bleaching system, just like the one featured on the ABC make-over shows. This is a system where you will sit in the office and have your teeth whitened in 1-2 hours. It uses a special light to help speed the bleaching process. This provides the most dramatic result. Take home trays are also provided with the ZOOM procedure to further the whitening process and to allow for bleaching touch ups in the future. The only negative for bleaching is that we can't predict how much whitening one will achieve.